Happy Monday everyone! Today I’m SO excited to finally share with you Isla’s beautiful nursery that was designed with the help of Caitlin Creer Interiors and Oilo Studio. I wanted a feminine and sophisticated feel for her nursery (with lots of pink, shocker ;) and I’m so happy with how it all came together! It’s my absolute favorite room in the house and I cherish the quite moments spent with my teeny tiny Isla in this beautiful space. Now for the fun part! This is the biggest giveaway I’ve ever held (over $4000 in prizes) so I’m pretty excited about it!! Oilo Studio and all of the other amazing companies involved in this nursery reveal are teaming up to give away a nursery to one lucky reader! To see prize info, and to enter the giveaway see below. Good luck!!! Nursery & Baby Essentials Giveaway! Curtains: I had to have mine custom made to fit my window but there is an almost identical style at RH Baby. WOW this is such a beautiful space! I LOVE it! Isla’s nursery is absolutely gorgeous! I love all the pastel and feminine pieces and that rug is stunning. You have out done yourself, what a beautiful room for a little girl to grow up in! Wow! The nursery is BEAUTIFUL & I know that Isla is so lucky to call this her room. You get an instant feel of love & warmth from the room. Wow what an amazing giveaway! And what a stunning nursery. Isla is the sweetest. She is going to love growing up in that room! Such a beautiful and serene place for her to grow! I love it when a nursery is a bit more mature in decor for the parents to enjoy spending time in yet still fit for a baby. This looks great! 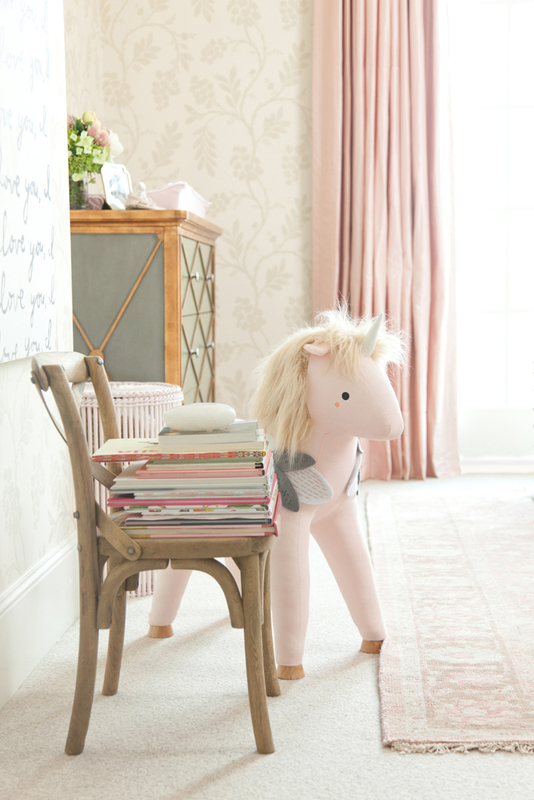 Such a lovely space…so perfect for your little girl! This room is stunning! Love the chair and the little horse! So sweet! Pretty room!! We want to see the nursery bathroom too!! The nursery looks so sweet and you little one is just precious. Such a beautiful and adorable nursery! When I get childrens in the future, I want their nursery to look like this!! I love the nursery! My husband and I are working on our nursery now and it’s incredibly overwhelming because there is just so much cute stuff out there at the moment for nurseries! I like that you kept the space very simple. Bratt Decor is based here in Baltimore and just walking through their showroom is an experience! Amazing!!! What a beautiful room!! I love this you seriously have THE BEST style ever! I just love! Beautiful! Love everything about this room! It’s gorgeous. Congratulations on your beautiful little girl. Crossing my fingers for this contest! oh my! how incredibly stunning! 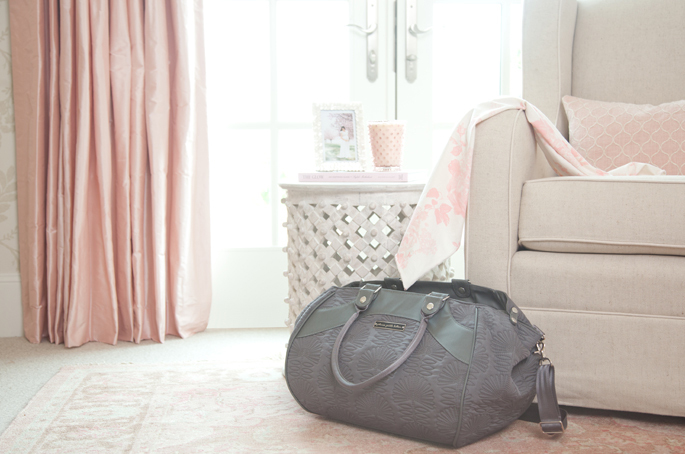 This is such a elegant and pretty space for baby Isla! It turned out beautifully! 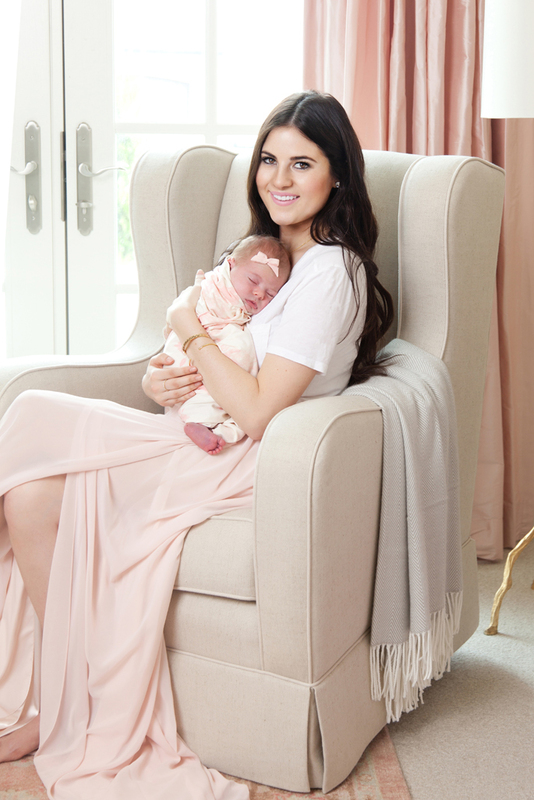 These are such beautiful photos of you and the babe, as well as the nursery. You can tell you are so in love! I like that the nursery reflects your personal style. That’s the best part about decorating for a baby! Wow, what a gorgeous nursery! I love all the pale and muted pinks, so relaxing and feminine! Wow! This room is breath taking!! I love it! It is so classic, but modern all at the same time! You did a fabulous job decorating! I have my baby girl Olivia Rose sleeping in my room much longer then I ever anticipated, she’s already 4 months old. Its so fun being a mommy though and you look fabulous doing it. 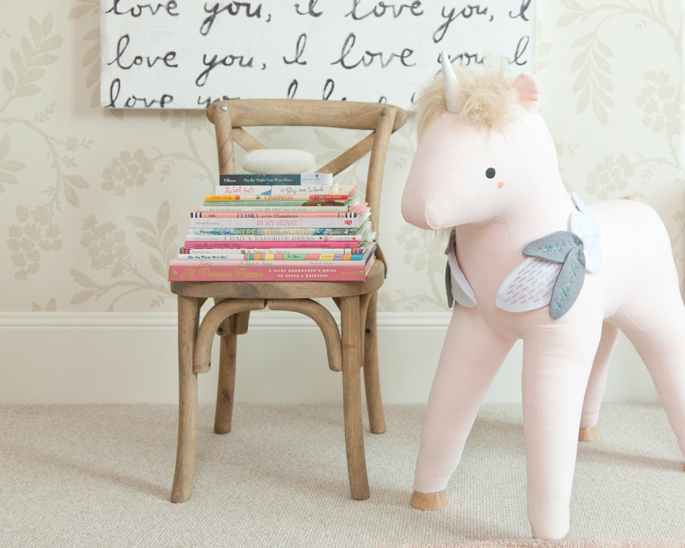 I love her room and I love the little unicorn and dresser. 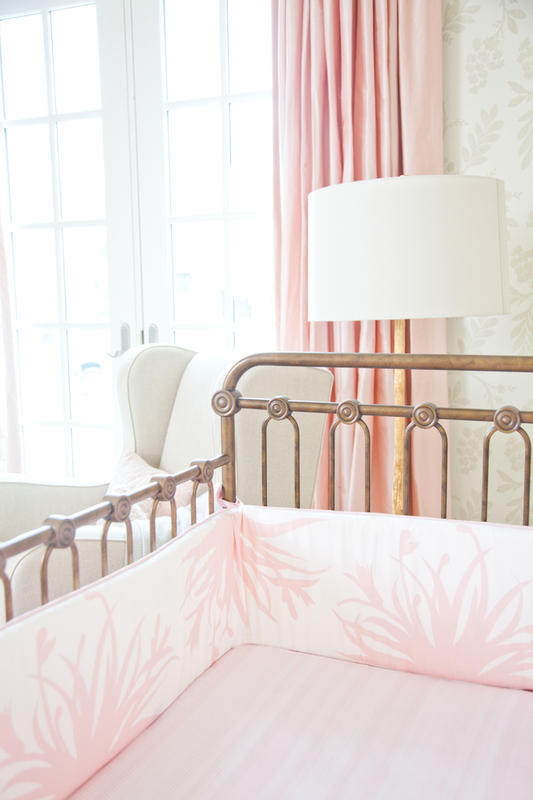 The nursery for baby Isla is perfection! I love her changing table and the I love you painting! So precious! Thanks for sharing Rach! What a stunning nursery! I love all the soft pink details and that sweet print. I hope you both have very happy memories in there. What a gorgeous little girl and a gorgeous room! Well decorated, it looks lovely! 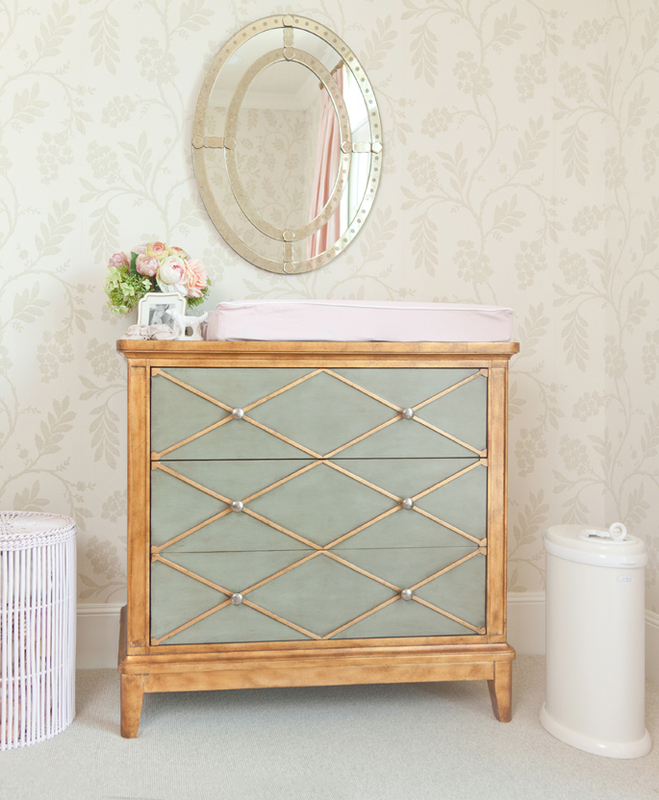 Your nursery is simply stunning! You also look gorgeous!! Love, Love, LOVE! Stunning, everything. Nursery, You and baby. Stunning! What a beautiful nursery! I love how the colors are so soft and delicate, so sweet and perfect for your baby girl! These pictures are beautiful! Your baby girl is so cute and her room is gorgeous! Congrats! Woooow…. What an amazing room!!! The blush color is really pretty! Love it so much! This is such a beautiful nursery, Rachel, so sophisticated and girly, but not over the top at all. 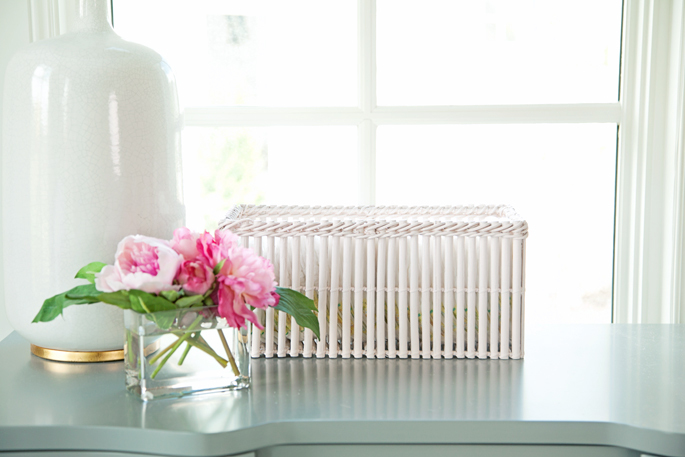 We’re sure you and baby Isla will make some beautiful memories together in here. Sophie @ Gigi Brooks. Oh my god love that dresser! The light fixture is gorgeous and of course so is your beautiful baby girl. You did a wonderful job creating such a lovely place for your little girl to grow up in! She is precious, you are a sweet mama! absolutely stunning. such a beautiful peaceful room and her little corner in your room is precious too! Beautiful nursery made for an angel. Aww she’s so cute!! Love the little unicorn! I really enjoyed this post. Beautiful nursery for your beautiful baby girl. I shared you giveaway on my FB. Such a beautiful nursery! I love the “I love you” print. So sweet! beautiful nursery, where is the pink pillow sitting on the glider from? I love it. I love this. So elegant and perfect! Her room is so stunning!! And she is such a little doll!! love the beautiful photos of you and Isla! OMG, this is the cutest nursery room!! I love how girly the room is without being tacky! Her nursery is so lovely! You look beautiful and I love all the pink! Congrats again. Wow! This is such a soft and lovely nursery shoot. I love her rustic little crib and never would have guessed that those flowers were faux. I would love to know what comfy shirt and swears you have on in the last pic?! Such a beautiful, calming space. I love the mix of reclaimed wood and gold with the pale pink. Isla is lucky to have such a beautiful room! I’m obsessed with the rug. Such a darling nursery!! omg ! Such a beautiful delicate and charming nursery ! ..feel so happy for you ! Absolutely stunning décor Rachel. Love these photos so much! Looking gorgeous both of you. These photos are so beautiful! This would be so amazing to win. What a darling room for such a sweet little girl! You have such a wonderful family and I love that you share these special times with your readers!! Love every decorations….beautiful pictures of ur daughter and you. 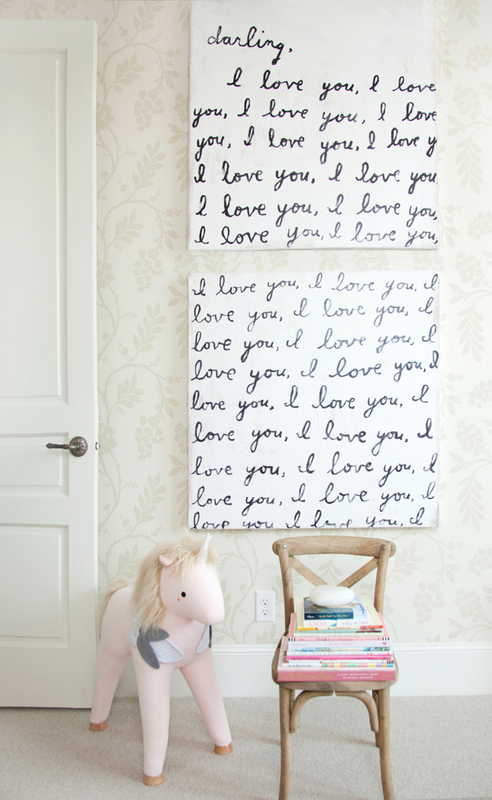 Obsessed with your nursery! It’s seriously the cutest! 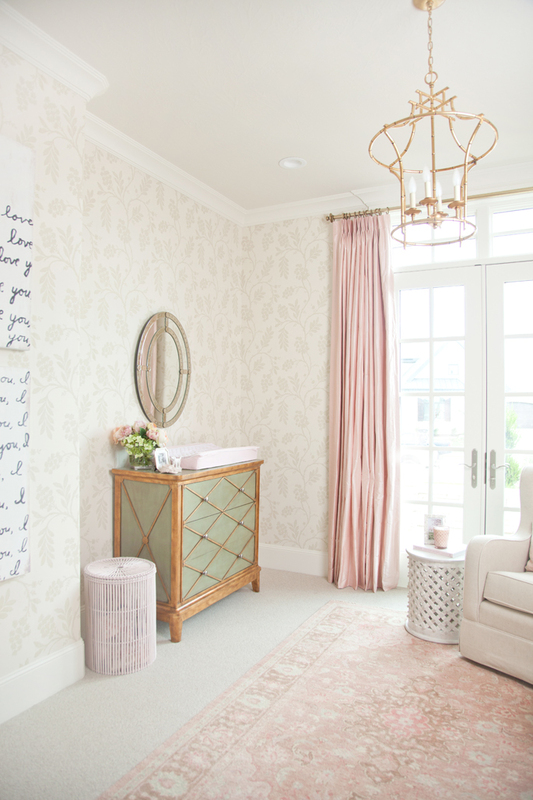 Such a beautiful, feminine nursery! Love it! Stunning! I love the chandelier you picked for the room! 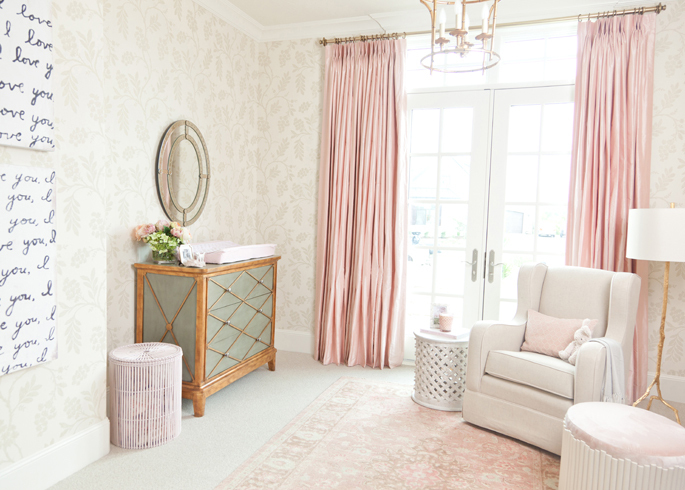 The nursery in blush tones is beyond gorgeous perfection! I love the rug and the unicorn. Oilo Studio did such an amazing job with the design. Thank you for sharing!!!! what a gorgeous nursery! i love it! and isla is so sweet! Beautiful!! I love those colors! They bring peace to any room! I am 33 weeks pregnant now with our little Henry Anderson Snow! This room is absolutely gorgeous! Thanks for sharing! This is the most beautiful nursery I’ve ever seen!!! I absolutely love every little detail, and the color palette is perfect! What a sweet little girl, and what a special way to welcome her to the world!! Winning this giveaway would be a dream come true… I’m a NICU nurse, and saving babies can be incredibly rewarding but also very stressful… So much so that I’ve been on bedrest for 9 weeks now with our first little girl, so I haven’t been able to set up her nursery at all! Keeping my fingers crossed!!! What a beautiful nursery! Perfect for your lovely baby girl! What an amazing nursery, I love the decor and color theme. Beautiful photos and amazing giveaway! Such a beautiful nursery! I love this! Thank you for sharing! Her nursery is too cute, so chic! oh my gosh! So adorable! I love the nursery! Isla is precious and her nursery turned out beautifully! You definitely have a knack for interior design. I would LOVE this so much!!!! The sweetest pictures I’ve seen <3 Congrats Rachel for you baby girl! The nursery looks amazing, a space filled with love. You’ve done such as a great job! I love the nursery! Ah wow Rach. Your nursery is extraordinary!!! what a dream nursery! your baby girl is precious! LOVE THIS. ALL THE GIRLY PINK’S AND ACCENTS ARE PERFECTION. BABY ISLA IS PRECIOUS. Absolutely gorgeous! I love the blush & warm pink hues that you picked. It is so glamorous they cozy at the same time. You are so good at finding that balance!! The curtains, rug and chandelier are so beautiful. The chair is so cozy. I am so happy to hear that is your favorite room! It is nice to have an incredibly beautiful room to enjoy all the precious moments with Isla! Also, you are looking so beautiful!! Motherhood definitely suits you! You look so happy and have a glow about you. Precious Isla Rose is so beautiful, too. I’m so very happy for you, Rach!! Oh my goodness! I love how soft and subtle baby Isla’s room is. And PINK! So pretty. Thanks for the inspiration. Baby #3 is on the way for me … I have two boys and I have a feeling this little one is a girl! How lovely! I’m expecting in December, so we don’t know the gender yet, but if it’s a girl I’m definitely taking cues from this gorgeous room! awesome giveaway! im a mom of two little baby girls! Beautiful and blessed little princess!!! Hey Rach, would you mind sharing where the wallpaper from miss Isla’s nursery is? Thanks in advance! Where is your nightstand and dresser from? I love it. Would you mind sharing your source for the wallpaper? Thanks! Could you please share where you got this wallpaper? I absolutely love it! This is the most beautiful nursery! Thank you for sharing all of the details. Could you also share the paint color for the ceiling and the wallpaper? What a beautiful nook of the bedroom! I have read through all your posts on home decor and have not seen where you mention = the 3-drawer periwinkle/blue dressers which brilliantly serve as your nightstands. Can you please share? Thanks!! Hi! Your nursery is so sweet! I was wondering what wallpaper that was? LOVE your new site layout/design and would love to see a house tour! :) We are currently building our home and planning to install marble countertops in all the bathrooms as well as the kitchen, but I’m so afraid to BE afraid to live life with them! Do you have marble in your bathrooms as well? Do you have any regrets or noticed any horrible etching? I would love your insight! Hello!! I came across your beautiful for your sweet baby girl and realized that you have the same chair that I have been looking to purchase for our new little bundle!! I was just wondering if you could give some feedback on your experience with the chair? Comfort, style, etc!! Also, if you could share where you purchased the lovely rug!! Where did you get the drapes custom made? I love this room! Would you be able to let me know where you the wallpaper from? I’m interested in the wallpaper… can you share where it’s from? Can you tell me where you got the nursery wallpaper? Beautiful nursery! Could you share a link to the wallpaper? Thank you! Where did you get your daughters wallpaper? I would love to know where the wallpaper is from??!! Hi there, i ABSOLUTELY love the rug uou Have in yOur nursery. I am trying to locAte it for Purchase online for mY nursery. Do you happen to know where i could find it for sale? It appears the sUrya website is for delears only. I would Really like to know where the wallpa is from. Hi, i love her NursErY! Where is yhe Wallpaper from? I am trying to find somethig similiar. Thanks! Hi! Your nursery is gorgeous! Can you tell me the wallpaper source? THank you! Hi each, just wondering where your nursery wallpaper is from? Beautiful! What is the wallpaper pattern/brand?